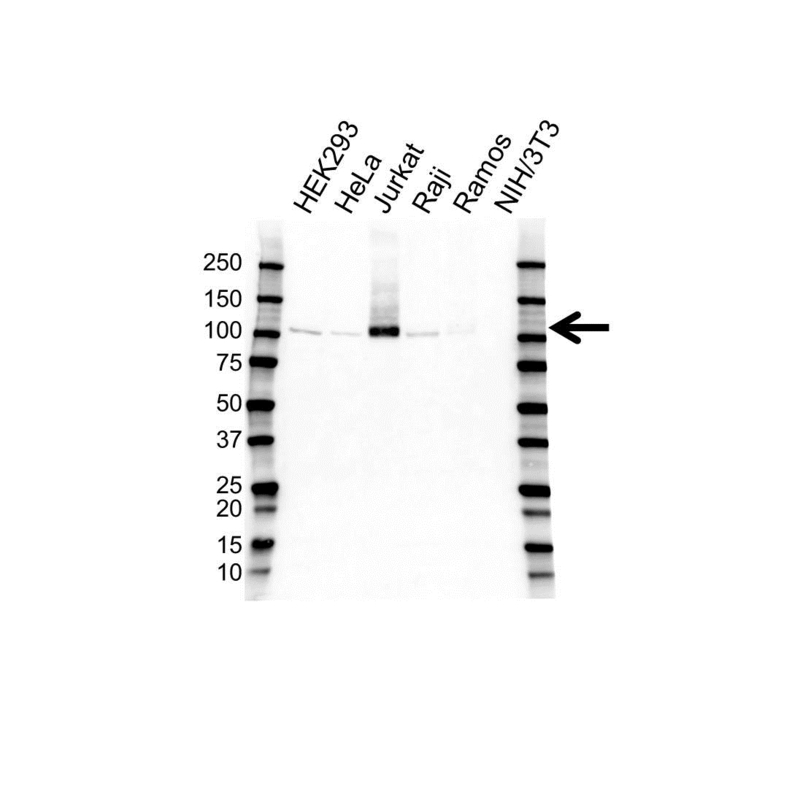 Western blot analysis of whole cell lysates probed with retinoblastoma gene protein antibody followed by detection with Goat anti Mouse HRP conjugated (1/10,000, STAR207P) and visualized on the ChemiDoc MP with 32 second exposure. Arrow points to retinoblastoma gene protein (molecular weight 110 kDa). Retinoblastoma gene protein antibody recognizes retinoblastoma-associated protein, also known as RB transcriptional corepressor 1 and retinoblastoma suspectibility protein. Mouse anti Human retinoblastoma gene protein antibody recognizes retinoblastoma gene protein, also known as retinoblastoma associated protein, RB transcriptional corepressor 1 and retinoblastoma suspectibility protein. The protein encoded by RB1 is a negative regulator of the cell cycle and was the first tumor suppressor gene found. The encoded protein also stabilizes constitutive heterochromatin to maintain the overall chromatin structure. The active, hypophosphorylated form of the protein binds transcription factor E2F1. Defects in RB1 are a cause of childhood cancer retinoblastoma (RB), bladder cancer, and osteogenic sarcoma (provided by RefSeq, Jul 2008). Mouse anti Human retinoblastoma gene protein antibody detects a band of 110 kDa. The antibody has been extensively validated for western blotting using whole cell lysates.